This listing is for three different 2 x 6 in. 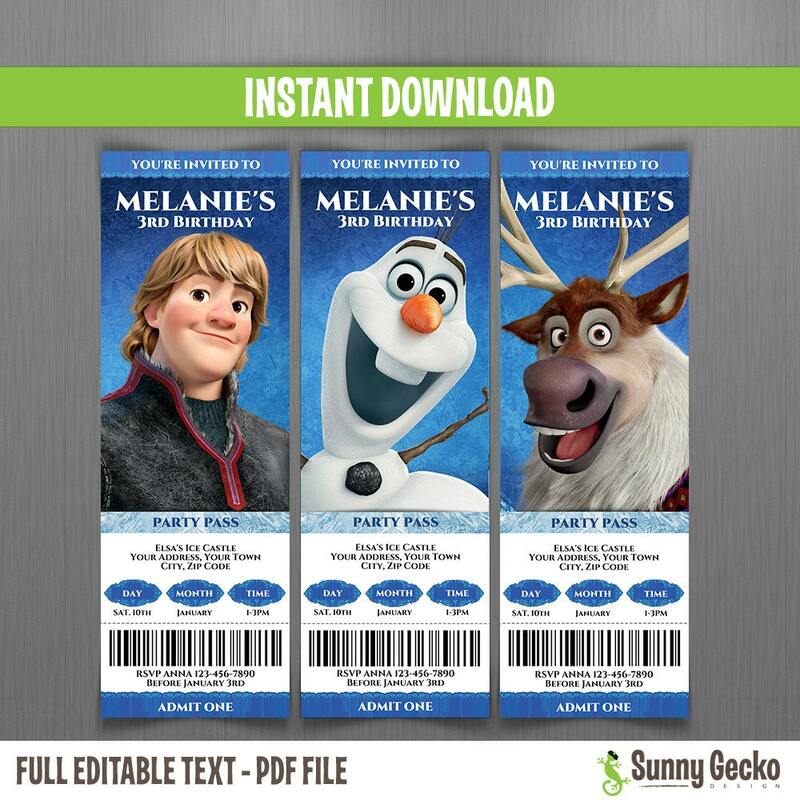 Disney Frozen Birthday Ticket Invitation designs, set to print FIVE per sheet of 8.5 x 11 inches letter size photographic matte paper or cardstock. 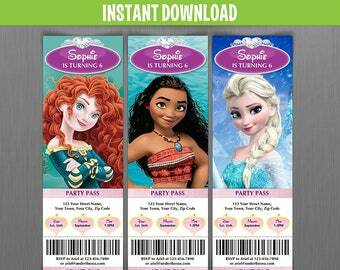 Do you want to check my other coordinated Frozen items for your party? Once you purchase the file, you will receive an email from Etsy with your download links. You can also access your download files via a link on invoice/receipt in your Purchases page on your Etsy account. - You CANNOT change the text/font type, color or location of any text, fonts or graphics. You can only type your own wording into existing text fields. - Because of the nature of digital files, this listing is non-returnable, non-refundable. Please read the listing carefully and let me know if you have any questions or concerns. - Please note that you cannot edit this party file on an iPad, iPhone, tablets or other handheld device. - This file is for personal use ONLY. You can NOT sell, share, copy, re-distribute or use these files commercially. - Colors may vary between online viewing and your actual printed product. All computer monitors display color differently as well as all printers print differently. So please take this into consideration when viewing your design. Because of the nature of digital files, my listings are non-returnable, non-refundable. Please read the listing carefully and let me know if you have any questions or concerns. My files can later be saved or copied to a USB drive, if you want to take them to a print shop... but beware: The files were meant to be printed on your house, because of the limitations that some companies have about printing this type of material. You should ask the print shop if they allow you to print it, before purchasing any of my listings, if you have plans to print it outside your house. Thanks for your understanding! Please also note for my digital images, the items are strictly for my time and creative services to create your item. All copyrights and trademarks of the character images used belong to their respective owners and are not being sold. This item is not a licensed product and I do not claim ownership over the characters used. Do you print your designs? No, sorry, I don´t print my designs. I only sell digital files. All my designs are made to be printed at home on your home printer. My files can later be saved or copied to a USB drive, if you want to take them to a print shop... but beware: The files were meant to be printed on your house, because of the limitations that some companies have about printing this type of material. You should ask the print shop if they allow you to print it, before purchasing any of my listings, if you have plans to print it outside your house.